That is the standard question for stories that traverse genres, right? For a good number of years been fascinated with book that give made into movies, or movies that have book adaptations. Some would maybe think there is a different. I highly doubt it. As a firm believer that the written word has shown me a great many things and often in greater detail than a visual story. This isn't trashing the fantastic abilities of any actor, but there is something to the imagination. Am I right, Dear Readers? Having the ability to imagine what Hogwarts really looks likes, imagine the path of the Fellowship to Mount Doom, or dancing with the prince of the realm is the joy of reading a book. That's the way I see it. There are some stories are also meant to be made into movies. Some stories just lend themselves to being brought to life with use of stellar cinematography and amazing animation. I don't always like movie adaptations. After all, Dear Reader, even a movie needs an AWESOME story to tell - an awesome screenplay - which is the movie equivalent to a novel, short story, or poem. And I am only picky because I want what's best for the story and I want the stories I like those stories to make me feel like I am reading the book, but in visual form. If a movie director (and/or screenwriter of the movie) chooses the wrong actor, location, or changes the plot of the movie then often the movie suffers. And I have seen some stories suffer, ~cough Eragon cough~. Anyway, it is all about opinion and when I review anything, I charge the reader to make their own opinions of the story, movie, TV show, writer, director, etc. And believe me, Dear Reader I will tell you when I do not like something. I have a critical eye for detail when it comes to a story that I like/love, and yes I might be partial to certain writers, but in the end I try to give the story it's full attention and look at it with a clear and mostly unbiased opinion. I am most pleased with a movie adaptation when they (the director, screenwriter, etc) pay attention to the little details, pay homage to the writer of the original work, and do their best to tell a story. Today's review is one of those where I was planning on being critical to my own fault, but in the end movie actually held it's own. Neil Gaiman wrote this book for his daughters, and as he points out in the very beginning, Dear Readers, he started for one daughter and ended for the other. It a children's story wrapped up for adults. I read it in one afternoon. It was that good. A different kind of story with characters that were a little annoying and even unlikable at first. I was still compelled to read on. The first thing that struck me about the characters in both the book and the movie. Note: there is a character that doesn't appear in the book, but is central to the movie's plot. Oddly enough, while I was angered by the character in the movie, it made from a fuller story. The character all felt real, even when they were being the too busy parents or the over the top neighbours. They all felt like these people could have been real people. I do like a delightfully eccentric character or five. The movie only added to their eccentricities. The story as a whole is the same is both versions. 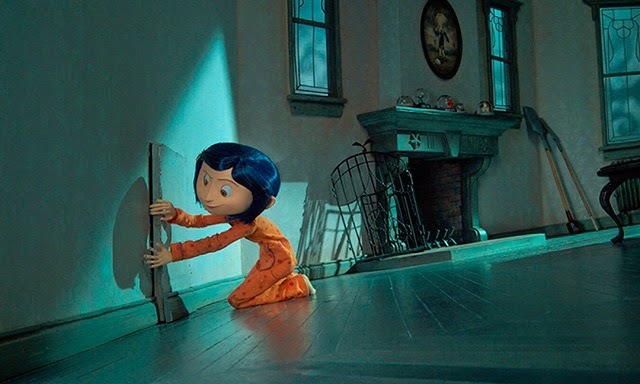 I have noticed that some of the events are a little out of order or expanded for the movie, such as when Coraline receives the stone and how many times she actually goes through the door in the drawing room. So, for story telling both versions are equally good. And I didn't feel so angry at the movie for mixing things up as much, or adding a character to the story. But, there was one, perhaps minor change (or misrepresentation) that wholly bothered me. Note: this is probably a spoiler, or enough of a spoiler that those of you, Dear Readers might want to avoid more of this part of the review. Of the three dead children trapped by the Beldam, the movie hardly mentions anything about who they were and also do not include that one of the children is actually a faerie child. The movie has them being released in a dream, but all you see is the three as little angel spirits going away. There is no picnic, which is in the book, nor are anything about the children mentioned. Except that I must also mentioned that one of the children is the sister of the additional character's grandmother who owns the house where Coraline lives with her parents, and then there's Miss Spink and Miss Forcible, and the Old Man with the Mice. In the movie. The book, Neil has Coraline dreaming of a picnic with the three children that she freed from the Beldam and she learns a bit of those she rescued (with their costumes and mannerisms); there is the young boy, the elder girl, and the faerie child. They were all from different times and are release to the worlds beyond (or whatever is beyond this life). This bothers me that the children in the movie are all treated as human from the same time period, when in Neil's world faeries are just as real as humans. Anyway, Dear Readers, while it bothers me, because in the book it gives you a greater understanding as to how old the Beldam and how long between her meals she goes. It is not something that makes me dislike the movie, it just makes the vision of the book a bit more real to me. As for the movie, the animation is incredibly stellar, the colours are vivid and drab, in a concurrent and discordant. 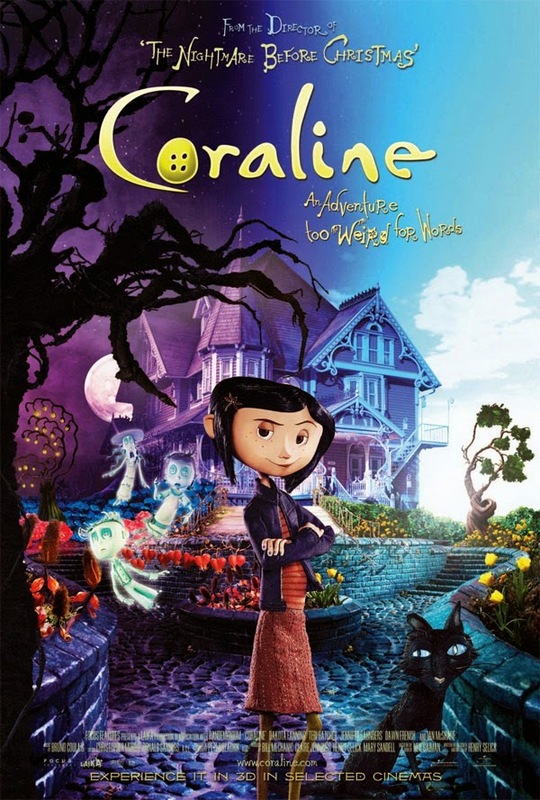 It makes the dichotomy of Coraline's and the Beldam's worlds even more vivid to the viewer. I particularly likes the snap dragons myself. Then there is the music, it is a blend of the macabre and the genial, peppered throughout and not overly done. Voice talents are good, I really didn't feel like it was Dakota Fanning playing Coraline and sometimes Coraline in the movie felt a little more disgruntled, maybe more an angsty teen, not a slightly different to her parents tween. I felt all the voice actors were chosen properly and fit the bill of their characters. 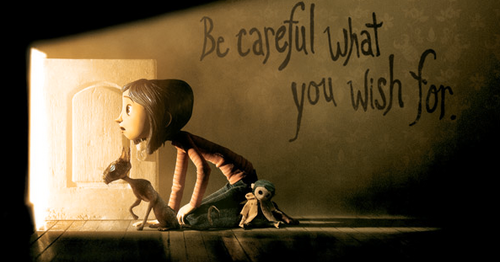 And as a whole the movie's story is a powerful one of the 'be careful what you wish for' syndrome. 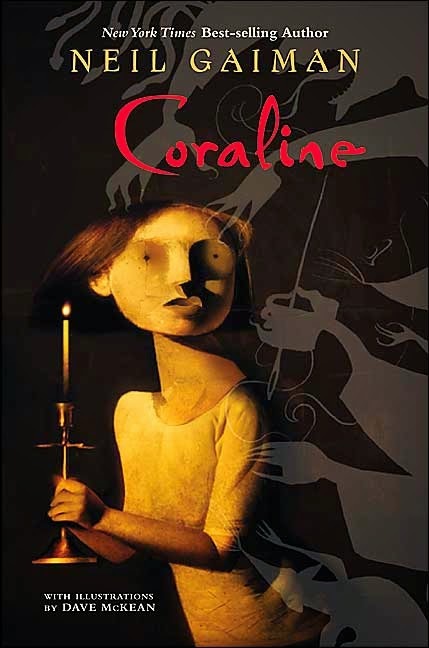 I will always side with the book; okay, some books I will never side with (A Separate Peace and Old Man and the Sea comes to mind), but as a whole Coraline the novel has my heart, while Coraline the movie is the goofy friend that I go out with on a Friday night. Both are good and I would recommend either to anyone. Please, visit Neil's website and check out his stories, novel, poems, songs , and awesome whatnot. *Pictures from Google search and Other Father Song from YouTube.